English summary: This is the first complete edition of texts known as The Book of Thoth, The Book of Isis, and a thanatological treatise found on both sides of two great magical papyri in the Museo Egizio of Turin, supplemented with hitherto unknown documents kept in the same museum. After acknowledging various helps for this edition (p. 7), the author presents a brief history of the investigation and a description of the papyri (pp. 9-19). The complicated and sometimes obscure hieratic script of the original made it necessary to present the texts in hieroglyphic transliteration (pp. 21-87) and a partiture-like synopsis of all available parallel texts (pp. 89-157). An Italian translation of the texts (pp. 159-173) is given together with an exhausive glossary (pp. 175-192). Included in this volume is a paleographical analysis by Giuseppina Lenzo (pp. 193-255) confirming the date of the manuscripts to the Twentieth Dynasty; several of them are even datable to the second half of this period. Italian description: Il volume è dedicato alla pubblicazione di due rotoli gemelli di papiro esposti nel Museo Egizio di Torino, scritti fittamente sulle due facce in grafia ieratica tracciata da uno scriba abile e forse da più mani. Oggi sappiamo che questi due rotoli, per quanto lunghi, non contengono la totalità dei testi riportati. 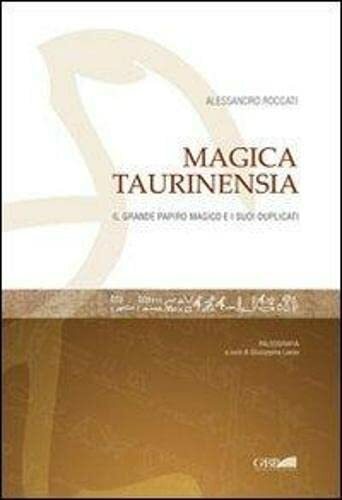 Ne presentiamo l'edizione scientifica, condotta considerando i documenti nel loro insieme: i singoli papiri sono stati interamente elaborati, anche per le parti che si riferiscono a testi diversi da quelli magici dei rotoli principali, come altre composizioni magiche, contabilità, un panegirico, quasi tutti privi di riscontro. Sequitur Books is an independent academic bookstore. We pride ourselves on exceptional customer service, a thought provoking selection and extremely fast shipping. Our motto, "For every person, a good book!" Refunds are given upon return of book within 14 days. If you are in any way unhappy with your purchase, please contact us and we will do our best to resolve the situation. Prices are as listed. Unless specified, we ship via the United States Postal Service. Domestic expedited orders are shipped via priority mail. Standard orders are shipped via media mail. Overnight orders are shipped via Express mail. Oversized, folio, and multi-volume sets may require additional shipping for international orders.